Risk-based border management is about using border crossing points (BCPs) as a risk management measure that supports flow-, border- and national security. As such, border management is an essential element in a toolbox for mitigating a wide range of risks. Risk-based approaches are typically used to select risk measures that are more proportional to the actual threat, while maintaining or even reducing the remaining risk: relaxed if possible, more stringent when needed. This implies that for people and goods that pose no significant threat, invasive checks at border crossing points can be limited. This should lead to less and shorter interruptions in the flow of people and goods, more freedom for passengers and less additional personal data (w.r.t. data already collected before arriving at the border crossing point) that must be transferred at those points, thus increasing the feeling of trust between public, public servants, commercial operators and travelers. The overall scope of TRESSPASS is to modernize the way the security checks at border crossing points (BCPs) are held out. The old fashioned way “All passengers pass through all the required security checks” seems to have worked the old times when the traffic was low; but nowadays with the ever increasing traffic this practice seems to fade out. 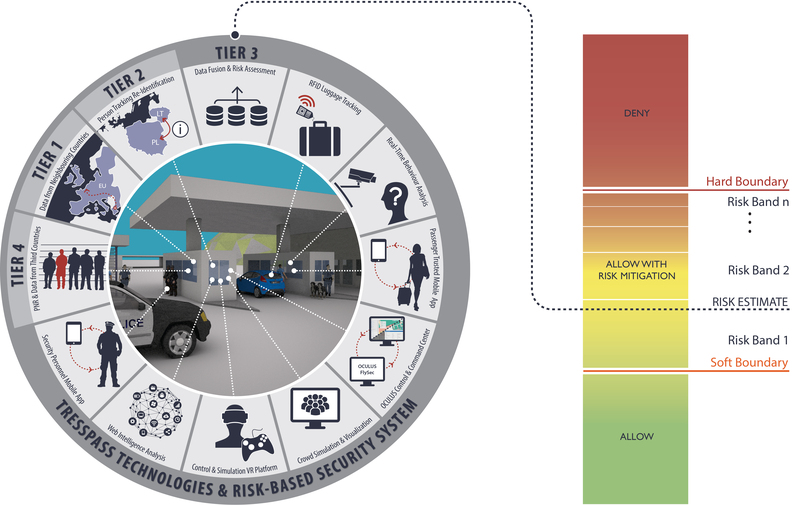 TRESSPASS imports the idea of “Risk based” security checks and proposes an analytic framework for modelling risk as well as a systematic approach of quantifying risk, based on a set of indicators that can accurately be measured across all four tiers of the Integrated Border Management. Once these indicators are accurately estimated from available data collected from background information, sensors and applications, the risk for each traveler is reliably calculated, based on the four-tier risk management approach introduced in TRESSPASS. Based on this risk, the system then adjusts the number and types of security checks required for each traveler, congruent with the associated risk, in order to maintain a desired security level while optimizing the security. Special attention is paid in maintaining a level of mutual trust between the security process and the traveler throughout the entire screening process. Extensive simulations will be used to first test the proposed approach before implementing and validating it in three different pilots covering all three modalities: land, maritime and air. Concerning modalities, the scope of this proposal includes air, maritime and land (including foot, car and train) border crossing points, and specifically travel routes that combine different modalities. It excludes border crossings outside of border crossing points, such as happens with boats of refugees on the Mediterranean. Concerning threats, this includes smuggling, irregular immigration, cross border crime, and terrorism, including threats to the transport itself (therefore, including e.g. aviation security). This proposal includes all four tiers of the EU’s Integrated Border Management access control model.